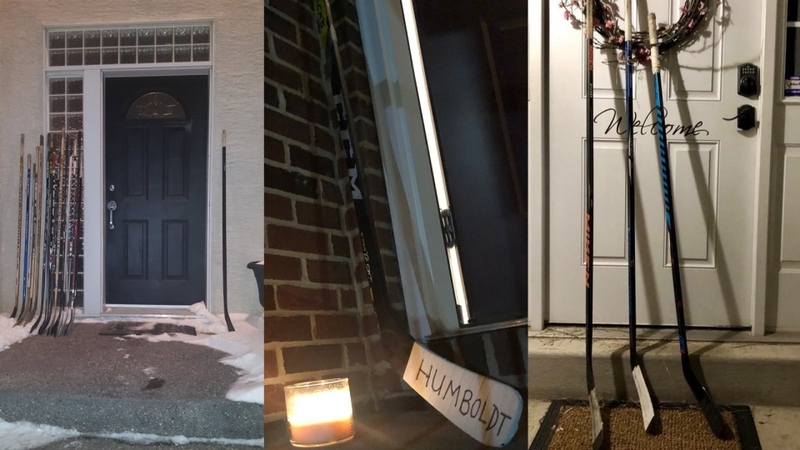 Social media users are propping up hockey sticks outside their doors in honour of the 15 Humboldt Broncos players and support staff killed in a disastrous bus collision in Saskatchewan. Photos of sticks lined up outside people’s homes have been trending under the hashtags #PutYourStickOut and #SticksOutForHumboldt. The symbolic gesture has swept across North America following an emotional Sunday vigil at the Broncos’ home arena in Humboldt, where thousands turned out to mourn the 15 individuals who lived and breathed Canada’s most beloved sport. TSN radio broadcaster Brian Munz appears to have popularized the stick trend by sharing a photo and message from one of his friends. Munz invited others to do the same, in a tweet that has been liked and retweeted thousands of times. Tributes have also been pouring in from the United States and elsewhere. The crash has touched the hearts of people around the world and generated a massive outpouring of sympathy in support. A GoFundMe page set up for the families of the victims has raised more than $4.7 million since Friday, and messages of sympathy have continued to trend online under the hashtags #HumboldtStrong and #PrayforHumboldt. Team captain Logan Schatz, 20, and teammates Jaxon Joseph, 20, Stephen Wack, 21, Adam Herold, 16, Logan Hunter, 18, Logan Boulet, 21, Parker Tobin, 18, Evan Thomas, 18, Conner Lukan, 21, and Jacob Leicht, 19, died as a result of the crash. Head coach Darcy Haugan, 42, assistant coach Mark Cross, 27, bus driver Glen Doerksen, 59, radio broadcaster Tyler Bieber, 29, and statistician Brody Hinz, 18, were also killed.